Enjoy basil varieties you won’t find in stores! Enjoy 7 different varieties of fresh and flavorful basil with this highly productive Kit. In only 4 months, this Kit grows up to $150 worth of basil vs. store-bought basil. 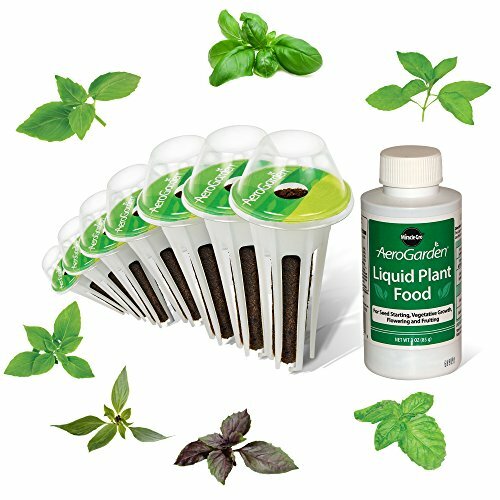 Our International Basil Seed Kit comes with everything you need to grow and works in any of our AeroGardens! Experiment with new flavors in all of your recipes – now you can grow fresh basil all year round, no matter the season. Planting with Seed Pods is fun and easy! Just insert the pre-seeded Grow Pods in your garden, add water and the patented, specially formulated Liquid Nutrients. Most plants germinate within 7-14 days, are ready for harvesting in 4-6 weeks, and will keep producing continuous harvests for up to 6 months and longer. Indoor gardening can’t get any tastier or simpler!